Click here to order a copy or view pages from inside the book. Shopping with Amazon.com is 100% safe. Since the early 1970s, alternative religious movements known as cults have been the focus of ever-increasing controversy in America. This reference handbook compares present-day cults to events in earlier American history, while primarily dealing with cults as a contemporary phenomenon. The key issue of mind control is covered in detail, as are deprogramming and the anti-cult movement. Overviews of the most controversial churches, and biographies of their leaders, are prominent features of this book. Legislative efforts and court decisions, particularly those surrounding the issue of religious liberty, are covered in detail. The volume features a directory of organizations in both the United States and Europe, a selected bibliography, print and nonprint resources, a chronology with the dates of religious events in American history, and coverage of events such as the Solar Temple and Heaven’s Gate incidents. 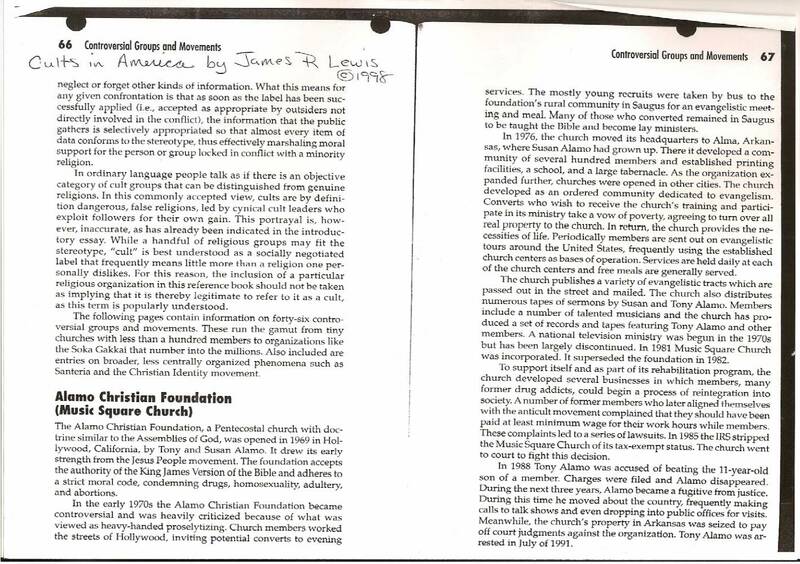 Alamo Christian Foundation (Music Square Church) identified as a cult on pages 66 and 67 of the book. Click on the picture below to view the pages 66 and 67 in the book.